Do you ever use ginger to treat nausea and vomiting? Properties of plants of this one was no doubt in dealing with nausea, but it helps if we know a bit of research that confirms ginger as an anti-nausea medications. 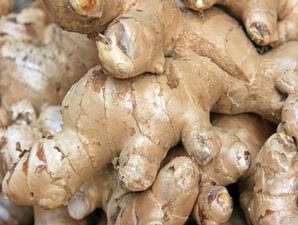 Ginger is a rhizome plant that is very popular as a spice and medicinal materials. Rhizome-shaped fingers are swollen in the middle sections. In Asia including Indonesia, ginger is used to treat stomach aches, nausea, and diarrhea. A study presented at the annual meeting of the American Society of Clinical Oncology, 2009 last year found that ginger may reduce nausea effects on breast cancer patients undergoing chemotherapy. The research was funded by the National Cancer Institute, which involved 644 patients, most women with breast cancer, who were undergoing chemotherapy at 23 oncology practices in the United States. In the study, all patients received standard anti-vomiting every day when undergoing chemotherapy. But some of them also took capsules containing extracts of ginger, three days before chemotherapy. The results showed those who took ginger experienced approximately 45 percent reduction in the risk of vomiting than those who did not take ginger, says Julie L. Ryan of the University of Rochester, the study's lead researcher. * Motion sickness: Some studies report that ginger does not have much effect in overcoming motion sickness. Another study even noted that ginger may reduce vomiting only, not nausea. Further research is needed to determine the effects that might result from the consumption of ginger and other hangover medicine. * Nausea and vomiting during pregnancy: Preliminary studies suggest that ginger may be safe and effective for nausea and vomiting during pregnancy when used as recommended dose for short periods of time. Nausea from chemotherapy: Report of preliminary studies suggest that ginger may reduce the severity and duration of nausea in cancer patients after chemotherapy. Other studies also showed no adverse effects from the consumption of ginger. However, further research will be needed to confirm these results. * Nausea and vomiting pascatindakan surgery: Some research reports indicate the consumption of ginger before surgery can actually trigger an increase in nausea or vomiting after surgery patients. However, other research shows just the different results that need further study. * Migraine: There is not enough scientific evidence to explain the effects of ginger in dealing with migraine. * Weight loss: For some people, ginger has been shown to be a tool to lose weight. However, further studies are needed to make a safe recommendation. As described in the book Efficacious Herbal Indonesia, ginger contains a variety of active compounds such as Gingerol, zingerone, 1-dehydrogingerodine, 6-gingesulfonic acid, shogaol, carbohydrates, palmetic acid, oleic acid, linoleic acid, caprylic acid, caproc acid, lauric acid, myristic acid, pentadecanoic acid, stearic acid, linilenic acid, lecithin, gingerglycolipids (A, B, C). Ginger also contains amino acids, protein, resin, diterpene, minerals, vitamin A and niacin. There is a volatile oil content in it: zingiberene, B-bisabolene, singiberol, zingiborenol, ar-curcumene and some aldehydes. Few side effects that may arise when someone is eating ginger in small doses. The most common side effects reported were bloating, heartburn, and nausea. This effect is most often associated with the use of ginger powder. Until now, there are still few studies that provide information about the safety of the effects of long-term use of ginger in a safe and guidelines of ginger supplements. In theory, ginger may increase the risk of bleeding when the same time you are taking blood-thinning medications such as aspirin, anticoagulants such as warfarin (coumadin), anti-platelet drugs such as clopidogrel (Plavix), and anti-inflammatory drugs like ibuprofen (Motrin, Advil) or naproxen ( Naprosyn, Aleve). Important is also known that ginger can also interfere with the work of drugs that alter cardiac contraction, including beta-blockers and digoxin. Before you start using ginger to treat any disease, it is better if you consult with your doctor, especially if you are undergoing long-term treatment.